EDINBURGH, June 10, 2014 (Xinhua) -- Scottish Deputy First Minister Nicola Sturgeon (L) is seen in Edinburgh, Scotland, Britain, June 9, 2014. EDINBURGH, Sept. 17 (Xinhua/Sun) -- Driving a taxi across Edinburgh on Wednesday with his comedy puppets and a big Yes sign at the front screen of the vehicle, Kenny Shuffler is making faces before the red traffic lights. With just hours before the Scottish independence referendum polling on Thursday morning, more signs of Yes and No are witnessed on the streets and inside shops at the city center of Scotland's capital. "I am definitely for Yes," Shuffler told Xinhua while waving the Yes sign to passengers on the buses alongside his vehicle. Holding one ugly puppet face to scare someone, Shuffler referred to the word of "scaremongering," which was emphasized by the Yes campaign to criticize the No campaign strategy to stress the political, economic and social uncertainties if Scotland is independent. Like Shuffler, the 76-year-old Samuel Wyper, who came to Edinburgh from his home 35 miles to the South to witness the atmosphere on the eve of Scottish independence referendum, told Xinhua that he chooses Yes. "We would like to control our own life and resources," Wyper said, expressing the belief that life for Scots will be better in an independent Scotland. "I follow the Scottish National Party all the way as a volunteer," he noted, giving his predication that the referendum outcome will "absolutely" be Yes in his view. However, for Laura who works at a office building management company, uncertainties in the Scotland separated from the rest of Britain are what she and her family most concern. 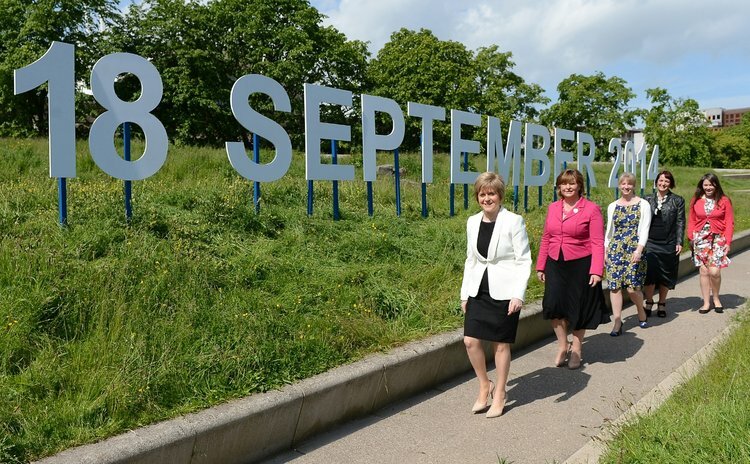 "We don't know what will happen in an independent Scotland, we chose No," she said, declined to give her full name. Both Yes and No campaigns are intensifying in Edinburgh, Glasgow, Aberdeen among others in final efforts to win over undecided voters on the eve of the Scottish independence referendum. However, Life along the Princes Street and Royal mile in Edinburgh is almost "business as usual" with some campaigners of both sides distributing leaflets to passers-by. Some street parties for Yes campaign with hundreds of participants are expected to be held in Edinburgh and some local communities Wednesday night. Scottish First Minister Alex Salmond is scheduled to deliver his final message ahead of the referendum at a rally in Perth in central Scotland on Wednesday evening. In Glasgow, former British Prime Minister Gordon Brown issued a final rallying cry for the No campaign, urging voters to tell nationalists to keep their hands off Scotland because "it belongs to all of us." The final result of the referendum is too close to call, according to the latest polls. Support for "Yes" was put at 49 percent against 51 percent for "No" when undecided voters were excluded, showed the Ipsos-MORI survey for broadcaster Scottish Television channel STV published on Wednesday afternoon. Conducted not for any media outlet, a Panelbase poll released earlier on Wednesday, suggested support for independence was at 48 percent, with 52 percent support for Scotland staying in Britain, once undecided voters were excluded. Official figures showed that about 97 percent of those eligible to vote in Scotland have signed up to vote in the referendum as the first Scottish independence poll is set to be the biggest poll in Scotland's history, with more people registered to vote than ever before. The total number of people who have registered for the referendum is about 4.29 million, more than for any previous election or referendum in Scotland, according to the vote's "chief counting officer." Out of the total votes, there are about 800,000 post votes from remote island communities, which had already arrived at the counting center in Edinburgh. The polling station opens early morning and closes on Thursday night, immediately after which, the vote counting starts. The final result is expected to be announced on early Friday morning local time. In October 2012, British Prime Minister David Cameron and Salmond signed the Edinburgh Agreement, allowing Scotland to hold an independence referendum in autumn 2014 on the question of "Should Scotland be an independent country?"